Do you know how to introduce interaction designer portfolios in interaction design interviews & adjust them for different companies? Here you got the answer. How to introduce your interaction designer portfolios when being asked to make a short presentation in interviews? To make a general introduction of the whole product design process or just focus on the design ideas of some specific functions? Which one is better? There are so many things to talk about: from users, design goals, usage scenarios, interface interactions to the results and other stages. Every tiny function shows designers’ ideas. Is the question “Could you please introduce your portfolios briefly?” too broad in an interview? How to answer this question? In this article, I will introduce how to make a presentation for an interaction designer interview in 4 sections. What do interviewers expect to see in your presentation? How to sort out your portfolios? Introduce your designs and face challenges. Interaction design is a skill. Product Mangers also need to make prototypes in many companies, so when there is an exclusive interaction designer, it’s possible that he will be the only “design resource” in this company. Before sending your CV and preparing your interaction design portfolio, please take a hard look at the experience and skills you have and check whether you are suitable for the job. Then, you need to find as much as information about the company to get a panorama about the working state in the future. In mature companies, as long as they are able to get the series C financing, the principal conversion rate maintains stable, the division of labor gets more detailed and the cooperation in big groups becomes the main working method, an interaction designer will definitely be in need. We have to make it clear that everyone got his duty in this kind of company: product staffs take care of the investigations and finding useful information from users’ feedback and demands; the UI design got a completed system, which requires the interaction designers to understand PRD rapidly and give their solutions. In conclusion, what mature companies need is a multi-solution. And if you can offer more than two prototype solutions for a single requirement, you will be the indispensable one. Normally, an intrapreneurship project that has got A-round investment or that from the parent firm, they are in the stage of refining the primary commodity, the product staffs are busy with prototyping and the group is getting bigger, so that more resources of interaction design will be required for its multi production lines. In these firms, you will face all kinds of situations: various business modes; the exclusion from designers who entered before; designs need norms and to be concluded. Besides, as the first interaction designer in firm, it’s possible that your professional designs are criticized “unusual”. In short, what these firms need is an assistant product manager who dose interaction design. You need to understand business requirements and present your prototypes in the shortest time. Startups are firms that have just finished the angel round or pre-A round, or even just seeds waiting for raising the financing. Their product staffs need to prototype themselves normally with the objective of releasing the product in shortest time, while the firm itself is in the stage of trial-and-error. Of course, startups may have experienced employees from other mature companies, who put forward the need of a professional interaction designer to the director. Then, the HR will find the one they need according to their requirements. You should know that in these firms, business goals change fast without regularity, even the boundaries between different positions can be ambiguous. Everything can be altered for the sake of conversion. Enjoying the adventure, being willing to dedicate, overcoming obstacles are characteristics of people working here. In short, what they need is in fact a “visual designer who knows something about interaction design”, those who can find out user demands voluntarily and finish the design alone. The level of clients determines the development of a company in the “design consultation” filed. Not all the outsourcing firms are not worth working for. Those case-by-case design consultation firms help green hands to improve their skills and knowledge by letting them take part in outsourcing projects of human resource and subsequent iterations of product, from which they can get a panorama of the entire workflow (normally their clients are really big companies). You should know that the interests of clients are most important in this kind of company. Clients are always right. You have to try your best to win their satisfaction and their mistakes are wealth for you. Think clearly before sending your curriculum vitae to this kind of firm. Designers they want should be able to face and solve problems alone. 2. What do interviewers expect to see in your portfolios? Designers are known for their works. Basic skills like being able to use prototyping tools sophisticatedly to realize your design, no matter that you prefer the powerful Axure, or you just like to do everything on web with UXPin, and maybe you are a fan of Mockplus which thinks "Being sufficient is being the best". As an interaction designer you need to know one or few of them, but if you can got a chance of interview after the First Round, this means that you must have something that has caught the eyes of interviewers. 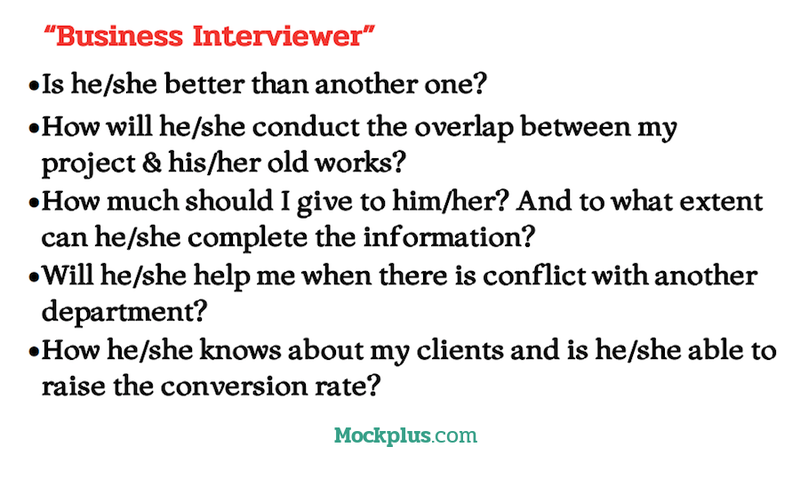 It is necessary to ask who will be the interviewer before attending an interaction designer interview and every interviewer will ask you to present your portfolios, but from different motivations and interests. No matter who is the interviewer, recruiting manager or HRD manager, the only reason that they ask you for portfolio is to verify. They need to make sure that your experience is true before judging whether you fit the job description. Though sometimes the HR manager doesn’t know much about your business, he will ask for the interaction designer portfolio because there is too much disinformation in talent market. What is the mindset of interviewers from HR department? PMs are those who give you assignment in the future. They will compare your skills with others by checking your works since they may have experience on interaction design and prototyping. Besides, out of the occupational habits, they are more willing to know how much you can understand the business requirements and whether you can manage them rapidly. What is the typical mindset of a “business interviewer”? If the interviewer is a developer, the product would likely be a technology-based one. They will estimate whether you can satisfy their needs through the designs you present. As programmers, your interaction design portfolio won’t work well with them, they will focus more on how your designs will be realized and whether you have considered about the technical cost. What is the typical mindset of technical interviewers? They will be both your partners and rivals. It’s easy for designers to feel special and confident in themselves, as seniors, they are used to estimate the “conflicts” and “comparing notes” of ideas in your works, which you should strongly present in your interaction designer portfolios, they hope that you can bring them novel ideas and maintain the relationships of mentor with them while you don’t lack basic skills. Of course, they also care about whether you are cost-effective. 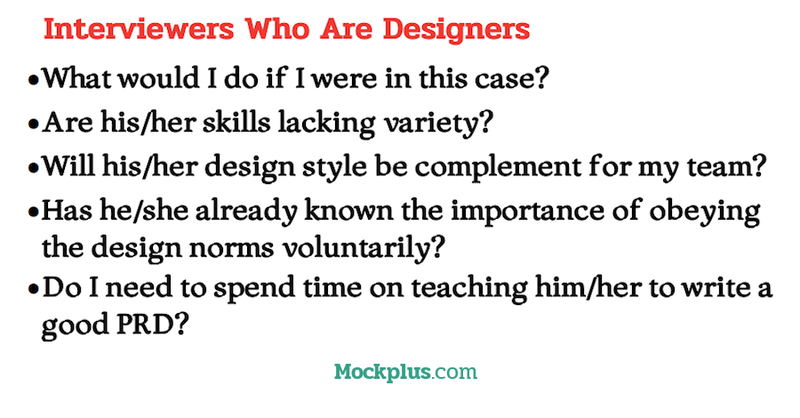 What is the typical mindset of interviewers who are also designers? If you meet interviewers who are in charge of product scheduling and client communication, it would be either an outsourcing firm or a company strict in efficiency. They care about the efficiency and rework rate, you are just one of the design resources from their point of view, the most important is that you are good at promote your works, in which highlights of design should be seen, and suffer from stress. What is the typical mindset of an “efficiency interviewer”? In these 2 sections, we’ve talked about the requirements of different companies & interviewers and the challenges we might meet in the future. If you have decided which or what kind of company you want to enter, with those points kept in mind, now you can start to sort out your interaction designer portfolios. In the next part, we are going to talk about how to prepare your documents adequately and introduce your design works.